There were rumors In Indian Media from last week that Former Pakistani legendary Cricketer Wasim Akram is getting married with Indian Bollywood Actress Sushmita Sen soon but now both Wasim and Sushmita has strongly rejected these rumors. Wasim Akram said while talking to a Pakistani news channels that he is tired of such rumors and he is not getting married with Sushmita Sen. Wasim said Sushmita is a good friend and a very graceful lady. On other hand Sushmita Sen also rejected these rumors on Twitter. Sushmita said on Twitter that Wasim is a good friend of her and there is already a good lady in his life. She also criticized Media for spreading such fake rumors. This is not the first time that Media has spread rumors about marriage of Wasim and Sushmita but it has been done many times before as well. Update: the big latest update is that Wasim Akram is actually dating an Australian women named Shaniera Thompson with whom he will get married soon. Wasim Akram has also confirmed this news while talking to media. Here is a pose of Wasim and his girlfriend. 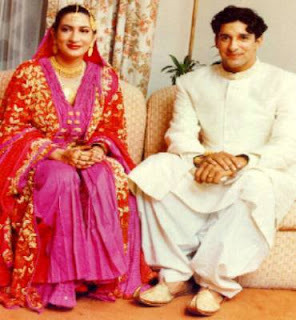 Wasim Akram is already father of two kids with his late wife Huma who was passed away in 2009. couple was married 1995 and it was a love marriage.